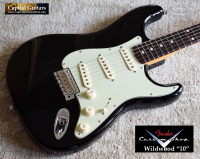 If you missed out on the lovely Fender Custom Shop Wildood 10 NOS Stratocaster we sold recently (R83432), then you are in luck. 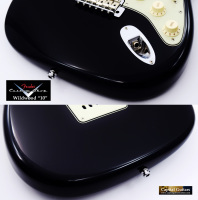 Offered here is a nearly identical guitar, Fender Custom Shop "Wildwood 10" '61 NOS Stratocaster, serial number R62807, also in gloss black, for your consideration. 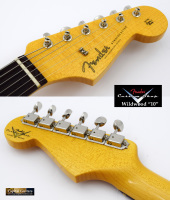 "Wildwood 10's" are of course named for their flatter freboard radius necks and the popular Colorado-based Fender dealer these guitars are made exclusively for. Next to Master Built instruments, WW 10's are the best Fender Custom Shop guitars currently being built. 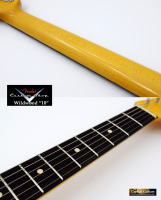 The specs for this incredible piece include: a light Alder body with a total guitar weight of just 7.6 pounds; a gloss black nitro lacquer finish; a lovely quartersawn Maple neck with a 'John English 59 C' shape and depth measurements of .86" at the 1st fret and .98" at the 12th; a dark Rosewood fretboard with Wildwood's namesake 10" fretboard radius, Sanko 6105 frets and a 1.650" bone nut; and for electronics, three hand-wound John Cruz LTD Custom Shop single coils with the middle pickup RWRP, master volume, two tone controls (with T-2 for bridge pickup), a five-way switch and modern wiring. 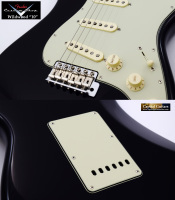 Except for the more desirable Cruz pickups and the slight weight difference, these specs are nearly identical to the guitar we recently sold. This Strat has it all. It's light and nicely balanced. The neck is a nice chunky C-shape - not too big and not too small. The Cruz pickups have a great vintage tone and output. Please check out the brief sound sample provided to hear for yourself. This is an NOS format guitar with no factory aging and it remains in near mint condition with little sign of play. A few scuffs on the pickguard and back plate are about all you will find. The frets are in near mint condition as well. 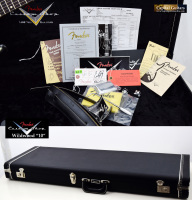 It comes in it's original G&G case with the certificate of authenticity, the build sheet and the original accessories shown. Wildwood Guitars gets $4K for one of these new, but you can get this lightly-played 2011 example for a grand less. 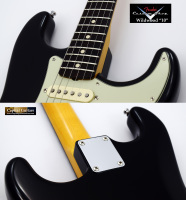 A great Strat in a great color and in great condition. Make this black beauty yours!